A little while back the International Volunteer Committee I’m a member of, Jomo Jet, started a huge project. Normally we do community events like orphanage visits and craft events, but during the summer holidays we decided to take a little bit more time and make a promotional video for Gunma. Loosely inspired by the Saitama Anime Tourism Campaign as well as Where The Hell Is Matt, we spent a few hot sweaty days trucking around the prefecture filming as many locations as we possibly could. One of our super talented local friends (Manny Marx from The Uchujins) made a track to go along with it, and our fabulous member Lindsay just finished editing it all together. Hopefully we’ll get a chance to do more videos, now that we’ve got this one under our belt! What do you think of this one? And what we should film next? This entry was posted in Video and tagged adventure, Gunma, Gunma chan, Japan, Japanese, sights, sightseeing, tour, tourism, travel, vacation, vacation pictures, video. Bookmark the permalink. 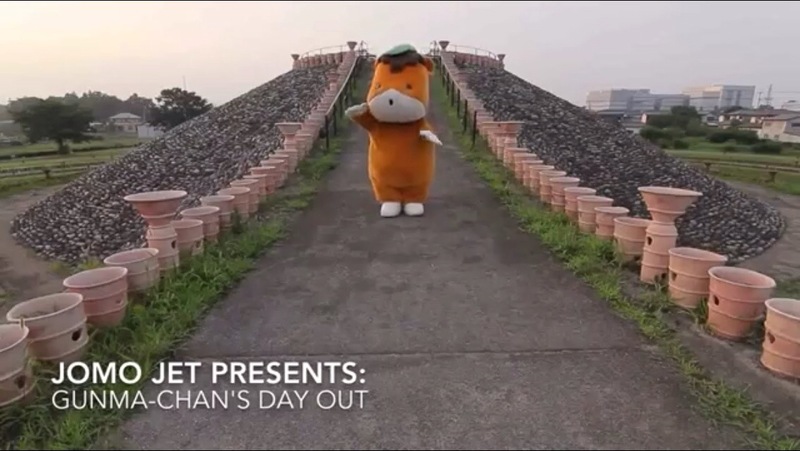 7 Responses to Gunma-chan’s Day Out! Bravo! I loved the sight seeing! Looking forward to your next project. Yay! I’m happy you’re happy! I loved seeing the Gunma sights with such a great guide!